You can ‘gift’ 2 of your monthly Massage treatments in any 12 months – just complete the gifting form and give to us (so we can check who is using your membership). 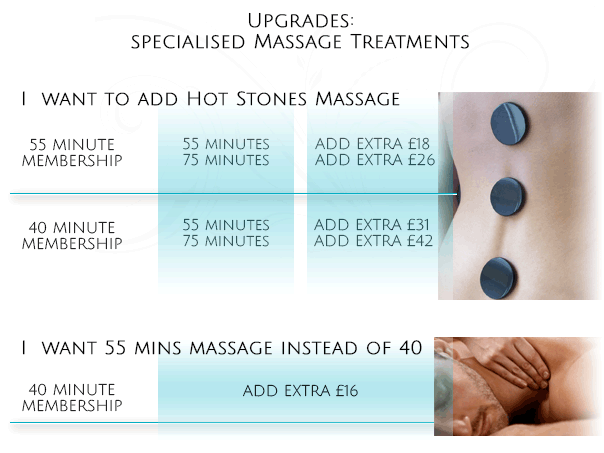 You can upgrade your massage treatment by adding the extra payment. As normal it is the client’s responsibility to cancel any monthly payments as we are not able to give refunds. All 12-month memberships auto-renew on a month to month basis after the initial term, with a month’s notice to cancel. If you cancel your direct debit the massages must be used in a month, memberships cannot be ‘frozen’ or refunds made. By continuing to join Qi Spa Massage Club you agree to our T&Cs, Privacy and GDPR Policy. Your first massage can be anytime after 8 days of activating your Direct Debit. You will need to sign a payment declaration within Qi Spa during your first treatment.